Scottish Church College is a Christian, Non-Profit, Liberal Arts, College established in 1929. 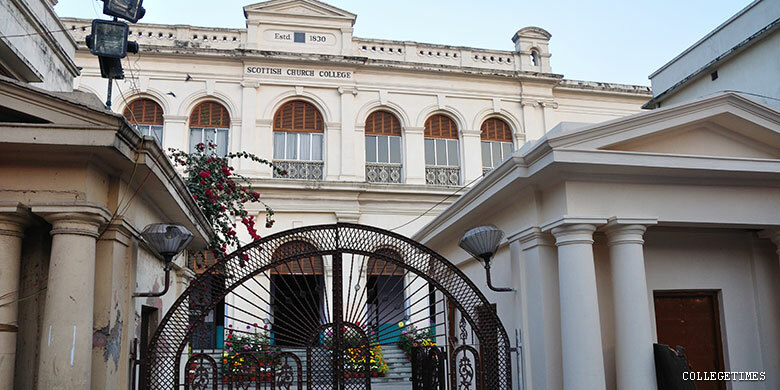 The campus is located in Kolkata, West Bengal, India and hosts students with an endowment of . College days may be fraught with minor obstacles but they are festooned with memories nevertheless. The human mind knows the craft of ‘obliterating the bad and magnifying the good’ memories. Many thanks to this capacity of the mind, days gone by bask in a beautiful dusk of nostalgia. However, if you let the minefield of memory explode too directly on you, you hinder a neutral enquiry. Thus, a more incisive, vantage-point observation requires an unprejudiced glance at the college days. I had the unique opportunity of being part of a much-talked college in Kolkata. Marxist fetish for nomenclature has turned Calcutta into Kolkata and in its wake also anti-urbanized many of the colonial sentiments. Without digressing too much, I would like to present you an imagery of Scottish Church College, my alma mater. It is built in a way that evokes thoughts of badly done Portuguese architecture. The expanse holds a lot of promise but the implementation and styling flatter to deceive. Overall, in its yellow panels, facades, pillars and corridors, Scottish Church seems to contain an elegy to mis-architecture. This however does not take away a wee bit from its spirit. The entire place is inundated in a hybrid sentiment; a place where the sense of idyll merges into the contemporary, creating a beautiful mongrel-self, a pinnacle of hybridism. The students keep fleeting by all through the wide campus giving it a feeling of being alive- yes very much alive. If one word could actually describe its ineffable self, it is ‘alive’. Another vision looms large over you even after the college is itself pressed back to memory yards. It is the vision of its college politics, communist apparatchiks holding court everywhere along the institution- SFI (Student Federation of India) taking the fight to CP (Chhatra Parishada translatable to Student Union). Whatever your bent, it is a disturbing scene to watch mainstream politics leaving its own subordinate self to take care of grassroots college polity. In my times it certainly took away from the sheen of education and last informed, things haven’t changed much. The mess or college canteen is more organized than many of its peers. An aspect worth remembering is the addas held in these canteens. Kolkata is known across the globe for keeping its heritage culture of addas alive and nowhere is it more manifest than the citadels of education. Scottish Church College certainly keeps the flag flying high in this regard. It is always a neat reflection of a college when its students debate over the economy, infrastructure, education and entrepreneurial adventures of a city rather than taking to slandering, bitching and asperse comments which are completely needless. Canteen food would prove to be a dampener at times but the place being at the heart of Kolkata, never showed up a dearth of fast food. No matter how badly one speaks of fast food joints, their concoctions do provide huge gastronomic relief; a lot more than home meals at times. I would let the purists argue to their heart’s content. For the sanctum sanctorum of education, the most significant aspect has to be education itself. Here, Scottish Church College would score brownie points. The faculties were brilliant in my times. I have been reliably informed that they have only improved over the last decade and a half. Seminars and Forums are allowing students to interact more informally with the champions of traditional teaching. I remember my professors not only solving a difficult problem but also suggesting alternative means to approach the same. The Chemistry Lab in my times was open to ideas and I can claim to have learnt the innate human art of experimentation more in the Chem. Lab than on any of the further stretches of life. The fee is negligible and you can pay it by using a small fraction of your pocket money. This only adds to the unwritten law of education which says that education must be imparted free of cost. Today, while pondering over my alma mater, I suddenly realized that I had so many thoughts to share, so many memories to pen, and yet I had let all these live inside me for more than 15 years. I hope this small observational piece will let you all understand my college better. With this hope floating within me I rest my pen.